The overall annual production of electricity in Newark, NJ would equate to approximately $529 in value for a 4 kW solar electric system that was without shade. This number does not represent the overall value the system brings, as it does not include SREC values, and it also does not take into consideration any tax credits or rebates that are of additional value to the home owner who purchases the solar system. The house that is being reviewed has a 14 panel solar electric system installed on it’s roof. This review will figure out the expected electricity production in kilo watt hours, the average monthly energy savings, and the expected annual savings in dollars for the system. Also, we will calculate the expected Solar Renewable Energy Credit benefits and federal tax credits that this size system is eligible for. This solar system is a great value. The annual benefits from owning this system are expected to be about $2,750. Also, this system is able to take advantage of a $6,300 federal solar tax credit. That alone covers about half of the total system cost. With the system lasting for over 20 years, it will clearly pay for itself, and provide a constant return on investment in the future. One thing that could have been changed is eliminating the shade that is reducing the efficiency of the system. 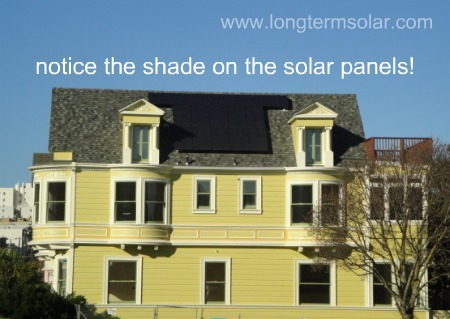 The 10% shading loss is something that can never be regained once the solar panels are installed. Is New Jersey a Good State For Home Solar? For almost ten years now, New Jersey has begun to really promote solar panels for homes. There are several very generous incentives and a New Jersey administered Solar Renewable Energy Credit program that help keep the investment costs of solar down which helps out alot. 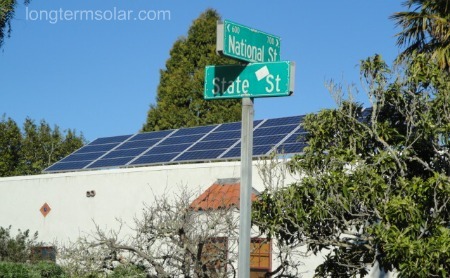 Currently, the state of New Jersey has more solar powered houses than any other state except for California, and this is a direct result of the rules and regulations for solar panels in New Jersey. Some of the factors that also come into effect like the average sunlight hours in NJ state, and the average price per kilo watt hour of electricity have also prompted residents to look into and eventually purchase solar power. So yes, New Jersey is definitely a great state for solar powered houses. Take a look at the house pictured above. This is exactly what is possible in New Jersey. This particular house has 28 solar panels. Each of the solar panels are 175 Sanyo solar panels. The total size of this solar system is a 4.9kW system. That is equal to 4,900 watts. Since the average amount of sunlight per day per year in this particular location is just about 5 hours per day, that means that about 624 kwh of electricity will be produced on average each month. That number takes into account the energy loss that occurs when the energy is converted from the solar panels into the electric panel of the house. If average monthly solar power production at this New Jersey house is 624 kwh/month, that is equal to about 7,500 kwh each year from solar. Currently, New Jersey is one of the best places in the United States to own a solar system. The combination of the incentives, SREC’s, and high electricity costs make it a win win for solar owners. Some of the advantages of owning solar right now in New Jersey is the benefit of not being as affected by price increases with the utility companies moving forward. Also, being able to take advantage of the SREC program is also very lucrative right now. NJ started a major push towards renewable energy back in 2001. At that time, there was a goal to have 30% of the states energy use created by renewable technologies come the year 2020. Well, as you know, 2020 is not too far away now. In order to meet that goal, the state put together some of the most advanced programs in the United States. To date, New Jersey has more solar electricity installed than any other state except California which is very impressive. In order to meet the renewable energy goal set out for 2020, New Jersey energy administrators knew that there needed to be some financing plans and incentive plans in place, otherwise people and businesses would simply not be able to afford solar panels. The NJ SREC program is a key component to making the overall New Jersey Clean Energy Program work. What Is A SREC(Solar Renewable Energy Credit)? An SREC is a unit of measurement of electricity that is produced. One SREC is given to a renewable energy operator each time 1,000 kWh of electricity is produced. The actual SREC is not electricity, but rather a certificate marking another 1000 kWh’s of clean energy production. And the SREC’s are quite valuable because they can be traded and sold at a later date. How are SREC’s Tracked and Accounted For? SREC’s are tracked by a tracking system which records all of the solar energy producers and the sizes of their systems. There are several calculations that take place, and the overall goal is to either estimate or record the known production of electricity from everyone’s solar systems. This tracking system also records each time a SREC is awarded to an operator of a solar system. This centralized tracking system makes it very easy for owners of solar to understand how many SREC’s they have earned. How Can You Sell Your SREC’s to the Utility Companies? The sale of SREC’s is the biggest benefit to this entire program. When you have accumulated SREC’s, you are then able to trade or sell them to interested buyers. The most common buyer of the SREC’s are the state utility companies. As the utilities companies need to meet state laws regarding clean energy production, they are able to purchase SREC’s from the private sector to make up for any lack of clean energy production they have. This is something that really benefits owners of solar because they are actually selling the credits right back to the utility companies. The actual value of the SREC’s can and does fluctuate. Since it is an open market to purchase SREC’s, everything is again based upon supply and demand. What is the Value of a SREC in New Jersey? How Do You Register Your Solar System for the SREC Program? People interested in taking part in the SREC program must register their intended solar system prior to constructing or installing the solar panels. Once you have submitted your application for the SREC program, you will be notified within about 6-8 weeks. If you are taking part in the New Jersey solar system rebate program as well, you will be automatically enrolled in the SREC program too. New Jersey is by far one of the most advanced states with regards to their renewable energy programs and incentives. The ideas and motivations behind the SREC program are definitely promising for the rest of the country to follow and recognize. In order for anyone to be able to afford solar power, incentives right now are necessary, and long-term solar incentives like the SREC program are very valuable to everyone.